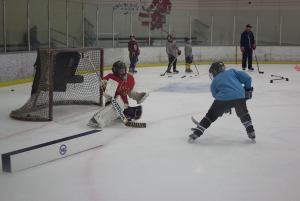 This year’s Thanksgiving Camp will consist of (3) two-hour on ice sessions and (1) one-hour off ice session, focusing on overall hockey skills. Camp is for Mites, Pee Wees, Squirts and bantams. Skaters will be divided into like age groups that will participate in zone drill training covering stickhandling, skating and shooting. Skaters will also participate in small area games that challenge players in game like situations. Camp will be held on Friday, November 23rd and Saturday, November 24th, 2018 (times below) at the Southfield Civic Arena in Southfield, MI. Groups are formed on the first day of camp in order to balance the levels of each age and skill group to keep a continuous competitive zone of training. Zone training keeps skaters on their toes and ready for a challenge. Our highly experienced 4D staff coaches and trains skaters to highlight the importance of core skills development and repetition. Camp is for Mites, Pee Wees, Squirts and Bantams. Skaters will be divided into like age groups that will participate in zone drill training covering stickhandling, skating and shooting. 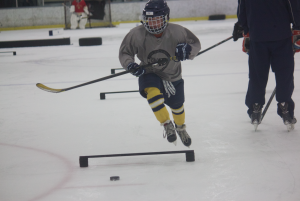 4D Hockey training camps are designed for players who are looking to continue to develop and strengthen their overall hockey skills, tactics and game sense. By covering all dimensions of the game, our dynamic skating drills challenge even the most proficient skaters.